(nee Rogers/Moore) of Vavenby B.C. Mom will be lovingly remembered by her children daughter Pat (Jeff), son Russ (Andrea) and son Brian, Grandchildren Charlene (Chad), Marcy (Derek), Lindsay (Jesse), Jordan (Alexis), Justin (Ashley), Angel (Nick), Jamie-Lynne, Natalie, Kevin, Great-grandchildren Tanner, Kallee, Aubrie, Cooper, Shyann, Regan, Torri, Harper, Kinley, Heidi, Calliah, Sister-in-law Helen Moore, niece Michelle, cousin Cindy (Joy), her many dear friends and honourary kids & grandkids. Judi was born in St. Bonifice, MB on January 5th, 1942 to Arthur & Barbara (Tingley) Rogers. After losing her father in WWII, she and her mother left the prairies for the mountains of B.C. 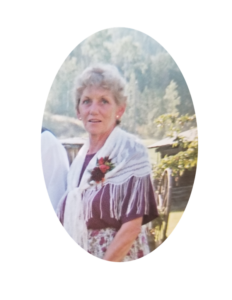 Her mother remarried (Leonard Moore) and as a family they settled in Bridge River Valley (Bralorne) where Judi fell in love with animals and the great outdoors. After graduating in ’59 as the valedictorian, with honours, and being turned down for vet school for being a woman, Judi became a farmer’s wife and mother. A true pioneer she enjoyed the simple things in life – farming, travelling, swimming, reading and most of all, her family. Family was her pride and joy. Grams’ knowledge, wisdom, laughter and spirit will carry forward through us all. Condolences on the loss of your mother/grandmother. I am fortunate to have had the pleasure of meeting her a few years ago.